Four Syriac Catholic seminarians will be ordained as transitional deacons in a Christian refugee camp in Erbil, Iraqi Kurdistan. They chose this step themselves, as 90% of the faithful of their Church are now refugees either inside Iraq or outside. In following Christ, we are called to do or accept things that are not pleasant, even painful. They could have stayed in the relative safety of Lebanon for this ceremony, but want to be with their people, imitating Christ. As we walk through this Holy Week of the Passion, let us lift up in prayer the descendants of the first Christians who are suffering unbelievable persecution, and also those Muslims who dare to convert to faith in Christ at the risk of violent deaths at the hands of their own families. We are so blessed – hopefully we can make this Holy Week truly holy for ourselves and those around us. Iraqi Assyrian seminarians. Photo courtesy of Remi Momica, second from the left. After their seminary in Qaraqosh was dissolved following a brutal ISIS attack in 2014, four Iraqi seminarians chose not to give up after being forced to flee, but to continue their path to the priesthood.Now, a year and a half after the attack that uprooted them from their homes, the four men will be ordained deacons, and have chosen a church in an Erbil refugee camp for the March 19 ceremony. “People want hope, and when they see that there are four young people who will become deacons and after a few months they will priests, that will give them hope and the power to stay,” Remi Marzina Momica told CNA March 17. Momica is one of the four seminarians from the Syriac Catholic Church of Mosul who will be ordained Saturday. All of them formerly studied at St. Ephraim’s seminary in the mainly Christian city of Qaraqosh, which is now under the control of ISIS. The young seminarians were forced to flee the city when the militants attacked on Aug. 6, 2014, driving out inhabitants who didn’t meet their demands to convert to Islam, pay a hefty tax or face death. Before being forced to leave Qaraqosh, Momica and his sister were among the victims wounded in a 2010 bombing of buses transporting mainly Christian college students from the Plains of Nineveh to the University of Mosul, where they were enrolled in classes. Since the Qaraqosh seminary has been closed following the 2014 attack, the four seminarians were sent to finish their studies at the Al-Sharfa Seminary in Harissa, Lebanon. The only seminary left in Iraq providing formation for diocesan priests in the country is the Chaldean rite’s St. Peter Patriarchal seminary for the Chaldean Patriarchate in Erbil. Archbishop Bashar Warda is the Chaldean Archbishop who oversees the Erbil diocese. 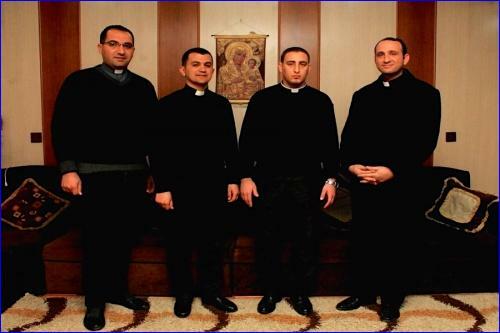 After completing their studies in Lebanon, the four Syriac Catholic rite seminarians returned to Iraq for their ordination. “We want our people to know, we want to tell everyone that there are young people who will become priests,” he said, explaining that the event will be a sign of hope for the Christians who are left. Fr. Giorgio Kahona, the priest in charge of accompanying the four men until their deaconate ordination, told CNA that the church where the ordination will take place sits in a refugee camp in Ankawa, a suburb of Erbil. He said they invited “the entire Church” to participate in the ordination, including bishops, priests and laity from other rites. Archbishop Yohanno Petros Moshe, Syriac Catholic Archbishop of Mosul, Kirkuk and Kurdistan, is the seminarians’ bishop, and will be the one to ordain them. Fr. Kahona said 90 percent of the Syriac-Catholic faithful in the Erbil diocese are refugees, so seeing the ordination of four young men will give hope to the local Church. Sharing his personal feelings on his ordination, Momica said he is both happy for the new step in his vocational life, but also sad that many of his family members won’t be able to be there. “I am very happy to become a deacon, I am so happy! But I am so sad because I am so far away from my town, from my seminary in Qaraqosh, and we lost many people,” he said. While his immediate family is with him in Erbil, Momica’s other relatives left after ISIS began their siege. The seminarian, who currently works with refugees, said that he would like to stay in Erbil after his ordination so that he can be with his family and other members of his Church. “I want to stay here in Iraq and I want to know if there is anyone who can help us to stay, to speak with the governments outside to see if they can help us to stay here,” he said. With the future of Christianity in Iraq uncertain, there are many who want to stay, but don’t see a clear solution in sight, he said. “Our people want to see what the future is here in Iraq for Christians. And…we don’t know the future of Christians here in Iraq,” Momica said, but added that despite the uncertainty, there are still people who are willing to give it a shot.